The artist and her guest Serena Carone transform the Museum of Hunting and Nature into a giant cabinet of curiosities. Inverting the rules, they give up being prey and provoke the spirit of the place with their phantasmagorical universe. 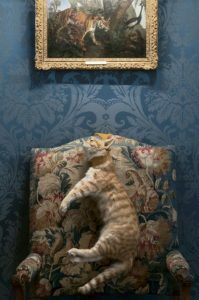 Works and texts responding to the four corners of the museum (like a cat hanging on the back of an armchair, next to the evocation of the three felines tragically disappeared Sophie Calle). The overall tone is not morbid, but rather sarcastic. 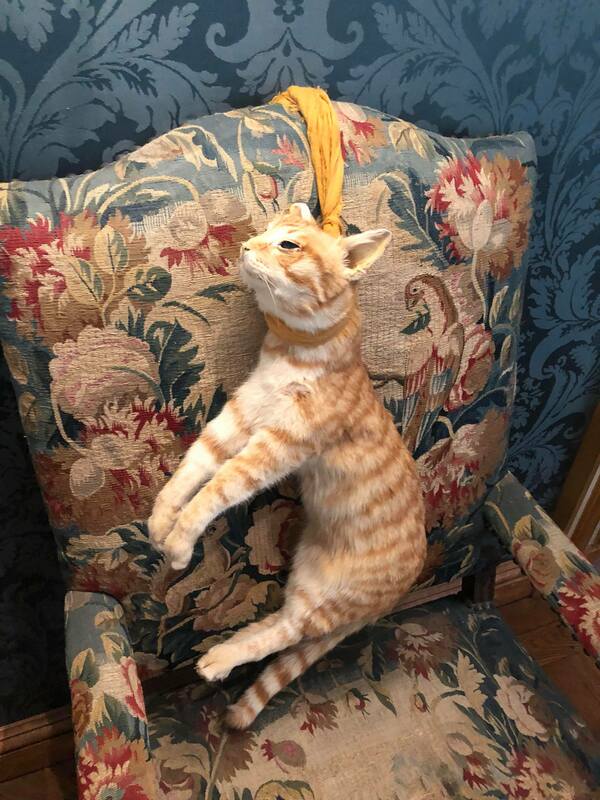 This work, from the series Real Stories, shows Nina, one of the artist’s cats, stuffed after being strangled by a jealous man. Museum of Hunting and Nature – Sophie Calle. This art work is really striking as far as cats are most of the time loved by human because they provide love, presence, company … Here, the cat is impuissant, position that is normally reversed the usual symbolism of the cat, normally seen as predator. In this art work, we are condemned to watch this terrible seen, as actors, we are impuissant. The overall composition is really interesting because we are completely inside the intimacy of Sophie Calle, as if we were inside her house. Despite this terrible abomination of killing animals, I loved the fact that the overall composition seems attentively thought : patterns, places of the furnitures… It seem that sophie call tried to hide the striped cat into the old flower pattern sofa, because the fur of the cat is extremely close to the colors of the furniture. 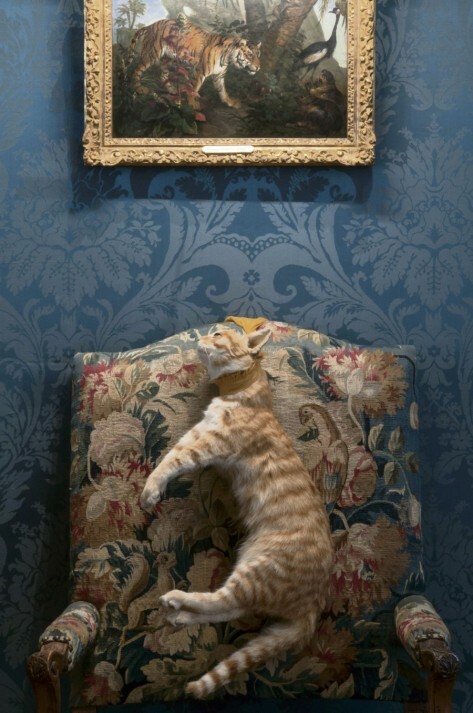 Also, the frame hanging on the wall behind really participate to the meaning of the art work in a way that it reflects the power of the felines in general, by directly referencing to the cat of the first plan (similar stripes). But the tiger is represented in a power position on the painting, contrasting with the hanged cat. I found this work really immersive because we feel that we are part of the work but my feelings were very confused at first since we feel uncomfortable, participating in this horror scene. It is by focusing more on the story of Sophie Calle, that I managed to appreciate the oevure, to a certain extent. By doing this, Sophie Calle denounce ironically but at the same time dramatically domestic violence I suppose, and violence on animals. Killing an animal shows how people can be that brutal and homicidal.